Give your Ibanez the gift of massive tone with the Ibby HM (Ibanez Hi-Mass) by Hipshot. Gorgeous curves machined from a solid hunk of billet brass, this bridge will give your guitar the punch and sustain it was born for. 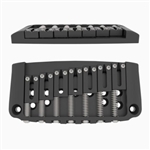 The 7 string Hipshot Fixed Bridge is the ultimate marriage of performance, beauty and ergonomics. Hipshots Vintage Hardtail will never corrode, even the screws, springs, and saddles are solid stainless steel! The Stainless Steel construction means not only an improvement in longevity, but also an increase in sustain and top end from your tone. The stainless steel saddles have a crisp string relief edge, eliminating dull tones and maximizing string vibration. This is a bit of an obscure one to be honest – it’s a bridge built to mount to a vintage Telecaster®, or guitars built in that style, but rather than incorporating the pickup mounting on the bridge plate, this is the cut down version, so it’s much shorter, allowing you to do whatever you fancy in the space infront of it. All in all, its about 50mm shorter, so that’s plenty of room for a humbucker and its mounting ring, or a big old P90 if such a thing tickles your fancy! The Solo by Hipshot is a single string bridge system that gives you the timeless, classic style you want with the flexibility you need. A clever Hard tail Bridge with a String through Body configuration. Makes the fitting a little more tricky, but the eventual playability is great. All mounted on an eye catching, and individual base plate. A Great looking Bridge with a String through Body configuration. Makes the fitting a little more tricky, but the eventual playability is great. All mounted on an eye catching, Vintage style base plate. Top mounting Hardtails are a bit of a rarity, but we carry this one just incase. Our lipped Hardtail, string through body, 6 mounting holes, big and chunky throughout. These "bullet" ferrules are a slight departure from the original version of the 50s and 60s. They initially debuted as a companion part to a set of strings in the mid 70s and more commonly seen on hard tails. other makes and models too.